As usual, I don't care what anyone says about it, I really like The Purge movies. And Election Year is my favorite of the series. Sure, the film and its predecessors have their weaknesses, but The Purge: Election Year is my type of film. 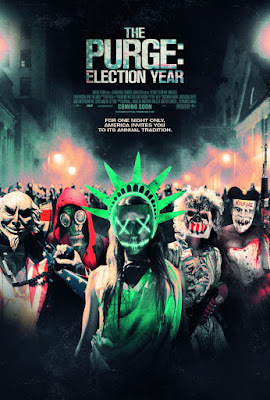 The core idea of The Purge series is simply incredible, and I really enjoy how each film is a different story set upon the same backdrop of a dystopian America of the future. Critics seem to discredit the films, and I caught a brief caption of an NPR article in which the reviewer complains about the film appealing to people's "basest desires" or some carrying on that people often do when critiquing splatter-type films. But I find that all of the films contain multiple parallels to modern society and layers of analogies that provide value insight into the issues of the past, present, and future. Furthermore, as an independent filmmaker and ultraliberal that likes violent movies, I consider the imagery throughout Election Year awe inspiring and a revolutionary move in filmmaking. Writer/directer James DeMonaco improves upon his craft and storytelling with each new film, and I have nothing but respect for that and DeMonaco's vision. I also just love a solid and rewatchable horror movie and the new-horror films that categorically fit on a horror shelf but are not necessarily horror. In fact, Google lists the film as Sci-Fi/Thriller. Personally, I just call it new-horror, and I love it!